The paper mill was founded in August 1857 by a group of men: Charles de Montgolfier, Alfred and Ernest Mame, Mr. Hettere and the bankers Henri and Eugene Gouin who formed a new company ?Charles de Montgolfier and Compagnie?. It expanded until 1950, it is well known and employs nearly 500 workmen.It manufactures there various papers like papers for catalogs, extra-thin paper and administrative paper. Repurchased in 1981 by the German group Seyfert, it does not cease to be modern and diverse. 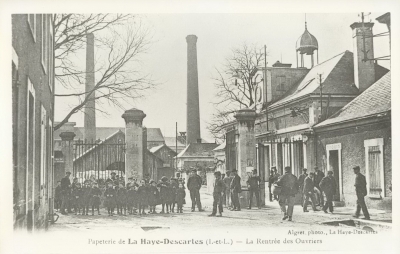 For the many workmen who came to work in La Haye Descartes, working-class quarters were constructed. The working-class quarters of the paper mills were built on the model of the mining cottages in the North. It allowed the workmen and their families to be placed near the factory. The inhabitants had all the services such as a school, a village hall, a laundrette, a vault? but they have disappeared today. The dwellings were resold to private individuals in the 1960's.